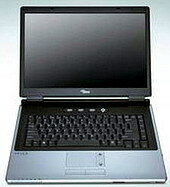 The Fujitsu Siemens AMILO M4438 is a high-end multimedia laptop designed for multimedia users and gamers. The laptop features a high-resolution 17in. widescreen Crystal View display, which has an eye-watering resolution of 1920×1200 pixel, and includes nVidia’s GeForce Go 6800 graphics card with 256MB of video RAM. The Amilo M4438 laptop also includes an Intel Pentium M processor (1.6GHz through to a speedy 2.13GHz), 256MB to 2GB of DDR2 RAM, and either a 120- or 160GB SATA hard disk, with some models even offering two-disk RAID technology. Fujitsu Siemens even plans to offer a 240GB hard disk option in the third quarter of the year. According to the company, the included 4400mAH Lithium-ion battery should power the 4.1kg M4438 for up to 2 hours. The Fujitsu Siemens Amilo M3438 laptop offers 1440 x 900 pixel resolution display but otherwise remains identical to the M4438. Naturally, the Amilo M4438 revolves around its 17-inch CrystalView display which, with its 16:10 aspect ratio and razor-sharp WUXGA resolution of 1920 x 1200 pixels, is a member of an exclusive elite which can take HDTV 1080 content and display it in all its glory. Furthermore, a Nvidia GeForce Go 6800 graphics chipset backed by 256 MB of VRAM delivers enough raw, unadulterated power to render the M4438 a highly interesting option for gamers – unless we’re talking first person shooters, in which case the 25 ms response time will counter the otherwise-excellent performance. This entry was posted on Saturday, August 13th, 2005 at 4:01 am	and is filed under Laptops. You can follow any responses to this entry through the RSS 2.0 feed. You can leave a response, or trackback from your own site.